(Letter from RLS to W.E. Henley, 14 September 1878, from The Letters of Robert Louis Stevenson, ed. by Bradford A. Booth and Ernest Mehew, vol ii [New Haven: Yale University Press, 1995], pp. 273-74). In this section you will find information about the route RLS took during his walking tour of the Cevennes. You can find more information about the tour in his Travels with a Donkey in the Cevennes (1879), which describes the journey. You will also find details of the places RLS visited in the weeks leading up to and the days shortly after his walk: Montargis, Le Puy, Le Monastier, Alais, Autun and Lyon. 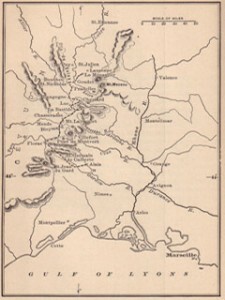 In late August 1878, RLS left Paris and headed to Montargis. He stayed here and in Le Puy en route to Monastier, where he would begin his walking tour. In a letter to his mother, he described how he spent his days at Montargis:“I rise before six, get to work at seven and work until eleven, when I breakfast: thence to about three, I walk or saunter around: from three to five or six, work again; six, dinner; and go to bed before nine. How’s that for health and industry” (Letter from RLS to his mother, late August 1878, The Letters of Robert Louis Stevenson, ed. by Bradford A Booth and Ernest Mehew , vol ii [New Haven: Yale University Press, 1995], p. 263). On 28 August RLS was in Le Puy. His address there was Poste Restante, Le Puy, Haute Loire. He left for Monastier shortly afterwards. (Letter from RLS to his mother, c. 6 September 1878, The Letters of Robert Louis Stevenson, ed. by Bradford A Booth and Ernest Mehew , vol ii [New Haven: Yale University Press, 1995], p. 267). He stayed at Chez Morel in Le Monastier until 22 September 1878, when he left for his walking tour. You can read about his experiences here in “A Mountain Town in France” (1896/97). This essay was originally intended to be published as the opening chapter of Travels with a Donkey. Instead, published posthumously, it describes RLS’s experiences with the people of Le Monastier: they found his accent amusing. Le Monastier is also the home of a museum with Stevenson holdings: the Musee Municipal, Chateau du Prieur, Le Monastier, Haute Loire, France. One of the rooms is dedicated to Stevenson and his time in Le Monastier and the Cevennes. The Town Hall in Le Monastier also holds documents of RLS’s journey. For more details, visit the Museums section of the website. The inn where RLS stayed, Chez Morel – now a chemist’s – boasts a plaque dedicated to Stevenson and his donkey. RLS’s September 1878 journey would take 12 days – he covered an incredible 120 miles. RLS buys Modestine the donkey: “You must not expect to hear from me for the next two weeks; for I am near starting. Donkey purchased: a love: price, 65 francs and a glass of brandy. My route is all pretty well laid out” (Letter from RLS to his mother, 19 September 1878, The Letters of Robert Louis Stevenson, ed. by Bradford A Booth and Ernest Mehew , vol ii [New Haven: Yale University Press, 1995], p. 276). RLS leaves Monastier to begin his walking tour. He passes through Goudet, where he has his lunch. He also stops in Ussel, a hamlet in the Haute-Loire department, because his possessions will not stay tied to Modestine – in the end RLS must carry some of his things himself. After more trouble with Modestine, they set off again. He asks directions as he plans to camp by the lake near Le Bouchet. Instead, he ends up in Le Bouchet itself and stays at the auberge there. The innkeeper at Le Bouchet makes RLS a goad for Modestine. Although she does not travel speedily, Stevenson thinks the goad markedly improves their progress. RLS next makes his way to Pradelles, Haute-Loire, which stands above the Allier river. After a quick lunch, he travels down the path to Langogne. He then crosses the bridge of Langogne into Gevaudan, where he spends the night. In the morning RLS sets off again. He meets with the kind old man from the day before, who guides him within viewing distance of Cheylard l’Eveque. In Cheylard, RLS goes to an inn before making his way to Luc (Lozere). He discovers that Modestine is in bad shape and will soon be unable to carry his belongings. RLS does not leave Gevaudan until 2PM. He plans to reach Cheylard-l’Eveque, and the weather is miserable. Around 4PM he reaches Sagnerousse (which is on Cheylard-l’Eveque territory). Shortly afterwards he becomes lost – although a kind old man gives him directions, he does not find his way. Everyone else he meets give him no sympathy or help. Finally, he finds some shelter amongst some trees and camps for the night. On the road to Luc he passes the ruined Chateau de Luc and its shrine to the Virgin Mary. He arrives at Luc and spends the night in the inn there. RLS now makes his way from Luc to the monastery Notre-Dame-des-Neiges (Our Lady of the Snows), near to La Bastide-Puylaurent (which he passes en route). This Trappist monastery (built in 1850) was destroyed in a fire in 1912. It was rebuilt on a site nearby to the original edifice. He stays the night at the monastery and meets with several interesting characters: Father Apollinaris, the eccentric monk, and a country parish priest and an old soldier who are horrified that RLS is a ‘heretic’. RLS leaves the monastery and follows the Allier river to Chasserades. He reaches Chasserades at sundown and goes to the inn there (where he shares a room with five other people). RLS travels from Chasserades into the valley of the river Chassezac: “At last the path crossed the Chassezac upon a bridge, and, forsaking this deep hollow, set itself to cross the mountain of La Goulet. It wound up through Lestampes by upland fields and woods” (Travels with a Donkey [London: Chatto and Windus, 1909], p. 113). From Lestampes RLS makes his way to Le Bleymard. After dinner in Bleymard, RLS begins to scale Mont Lozere. He camps here for the night, “among the pines”, relishing the opportunity to sleep outdoors. RLS so enjoyed sleeping under the pines, that he leaves a few coins in the dirt in the morning. He makes his way across Mont Lozere, at one point standing on its highest point, the Pic de Finiels. He descends, following a stream that eventually becomes the River Tarn. He now comes to Le-Pont-de-Montvert – the place is bustling, and RLS eats in a public-house and writes in his journal. He next follows a route along the valley of the Tarn, where he camps for the night (and sleeps badly). RLS awakes and washes in the River Tarn. He continues to walk along the Valley of the Tarn, passing the Chateau de Miral. He next arrives in Florac, where he eats at a café and then stays at the inn there for the night. RLS leaves Florac late in the afternoon. He journeys into Mimente Valley, where he sleeps in the hollow underneath an old oak. RLS now travels to Cassagnas. He follows the road to Saint-Germain-de-Calberte, where he arrives after dark and stays the night in an inn. RLS leaves Saint-Germain-de-Calberte sometime after 3PM. He travels along the Gardon of Mialet river, through Saint-Etienne-Vallee-Francaise, and as evening approaches begins to ascend the hill of St Pierre. By nightfall he reaches the summit and then descends to Saint-Jean-du-Gard. After supper at the inn at Saint-Jean-du-Gard, he stays the night. “It has begun to rain; a gray, glimmering day over Alais. I feel as if I had all the world upon my shoulders. I feel as if I had to do with everyone; this rain falling far afield, wets a tramp on the long highway, it wets the deck of a tumbling ship at sea. Do you know what I mean? My damned figurative mind obscures itself. The world is full of my clients, and I feel my heartstrings tied to so many different persons – and all doomed” (Letter from RLS to Sidney Colvin, 4 October 1878, The Letters of Robert Louis Stevenson, ed. by Bradford A Booth and Ernest Mehew , vol ii [New Haven: Yale University Press, 1995], p. 281). RLS’s mood suggests his anxieties about his future with Fanny Osbourne (who had meanwhile returned to America and her husband) and his writing career. He stays in Alais on the 4th and 5th October, then travels to Lyon, Autun and Paris. In Autun, RLS visits P.G. Hamerton at Pre-Charmoy. After Paris, RLS is in Cernay-la-Ville on 18 October before returning to London in late October. Every year, many people follow in RLS’s footsteps through the Cevennes. For more information see the website of the Assocation “Sur le chemin de R.L. Stevenson”, Mont Lozere, France.